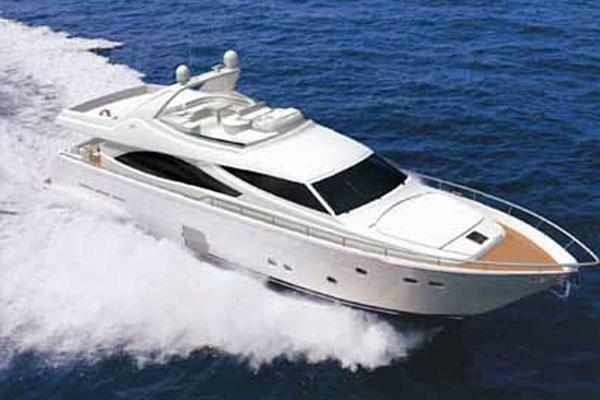 United Yacht Sales New Jersey would love to guide you through a personal showing of this 95' Azimut 95 Flybridge 2010. 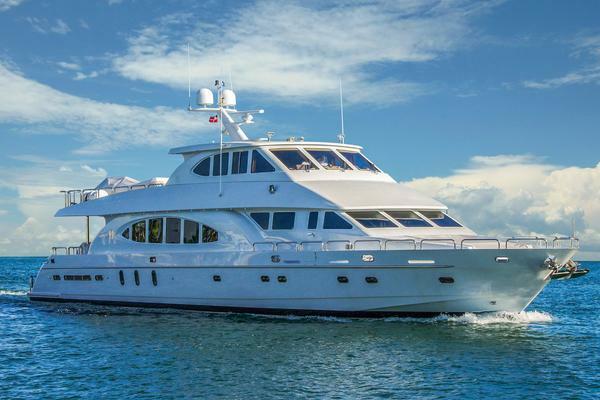 This yacht for sale is located in Pompano Beach, Florida and priced at $3,700,000. For a showing please contact us by filling out the form on this page and we will get back to you shortly! • The structural project of the hull has been carried out according to the High Speed Craft Classification and has been approved by R.I.N.A.• Vinylester Resin is used for the first coats of the hand laid-up lamination below the water line. This kind of resin is extremely effective in preventing osmosis thanks to its chemical and physical characteristics.• Worldwide acknowledge quality isophtalic resin is used for all the stages of the hand laid-up lamination process.• High quality PVC with outstanding mechanical peculiarities is used for hullsides, main deck and superstructure lamination with sandwich.• Engine room- collision, aft and bow master cabin bulkheads are in laminated sandwich. All other internal bulkheads are built with advanced composite materials.• Keel is deep V type with 9,6 AFT deadrise. • UPGRADE: Bauer Compressor with Scuba Diving Bottles Holder• UPGRADE: Hydraulic Lifting Swim Platform with Max Capacity 1.100 kg• Two Underwater Lights under the Swim Platform• Pair of pop-up Cleats on the Swim Platform• Two U shaped Stainless Steel Removable Handrails on the Swim Platform• Two Additional U shaped Stainless Steel Removable Handrails on the Swim Platform• Teak on Swim Platform• Structural Staircases with Teak Steps on Both Sides of the Transom for Access to Swim Platform. Stainless Steel Handrail on the Internal Side of Each Staircase.• Electro-Hydraulic Retractable Gangway in Stainless Steel and Teak on Transom, Starboard side.• Water Shore Connection, Shower, Fresh Water Outlet on Transom.• Shore Power Inlets, TV and Telephone Inlets Placed on Transom, Starboard side.• Black Water Shore Discharge System on Starboard Side.• Watertight Door to Access Lower Deck/Crew Quarters Placed in the Middle of Transom. • Four Cleats each Side• Gangway with Handrails on Both Sides• Provide covers for all the External Tables. Covers to be Padded with Felt in the Inside• Table to be Fixed, in Varnished Teak (matte finishing), with Compass Rose Inlay• Provide Two Additional Folding Chairs (on top of the STD four)• Curved Cabinet in AFT Cockpit with Fridge• External Surface in 8 mm Thick Teak.• C-Shaped Fiberglass Settee for 6 People, with Cushions.• Cockpit Table in Teak with Two Stainless Steel Bases.• Four Teak Folding Chairs.• Fiberglass Bar Cabinet with Fridge and Sink.• Salon Door in Tempered Glass and Stainless Steel Divided into Four Sections.• Stainless Steel Handrail on Both Sides of the Settee.• Control Panel for the Gangway and the Swim Platform, placed in the Handrail on Starboard side of the settee.• Stainless Steel Handrail for the Staircase to the Flybridge.• Two Stainless Steel Pillars to sustain the Flybridge Structure.• Two Stainless Steel Gates to Access the Swim Platform.• Fresh Water Inlets on Port and Starboard Side.• Water light Halogen Lights on the Ceiling.• Covers for the settee and the table.• Drainage Holes. • UPGRADE: Bimini Top on Bow• Chain Storage with Drainage.• Chain Washer through the Fire Extinguisher Hose.• Sunbathing Cushions Area on the Superstructure.• C-Shaped Sofa Integrated in the Superstructure, with Cushions and Backrest.• Watertight Halogen Lights Recessed in the Fiberglass Placed in the Sofa area and in the Bow Mooring Area.• Two Teak Coffee Table with Stainless Steel Base• Two Electric Wipers for Forward Windows.• Black Mesh for the Front Wheelhouse Windscreen.• Emergency Escape Hatch from the VIP Cabin.• Covers for the Teak Tables, Sofa and Sunbathing Cushions. • UPGRADE: Custom Isinglass enclosure, wraps from port side of arch to starboard side with 4 zippered windows• UPGRADE: Opacmare Crane on Flybridge• UPGRADE: BBQ grill as per 95-12- port side• UPGRADE: 4 person Jacuzzi Tub• UPGRADE: Sea Energy Maneuvering Joystick on Both Helms• UPGRADE: Cradle for Tender- removable• UPGRADE: Three Cameras connected to a Monitor in Wheelhouse and Flybridge and Installed in the Following Positions:- One fixed in AFT Cockpit- One Pivoting and Zoom in Engines Room- One Pivoting and Zoom on Extreme AFT for Docking Purposes• Three Swivel Stools with Backrest and Footrest, placed next to the Bar Cabinet, Upholstered with Vinyl Material without Squares• Flybridge Table with Central Removable Leaf• Hard Top with opening roof (new canvas to be replaced soon)• CUSTOM Jacuzzi Cover in Teak• Flybridge Floor in Teak• Do Not Install Hi-Lo Mechanism for the Table on Bow Starboard Side, with Sunpad on Top as Previously Requested• Second Radar Arch• Pair of Spotlights Recessed in the Fiberglass on AFT of the Flybridge• Remote Controls for Engines and Thrusters• Hydraulic Bow and Stern thrusters• Dual 6 person offshore Life Rafts (EV)• Top of the Bar Cabinet and the Fridge Cabinet in Varnished Teak (Matte Finishing)• Isotherm Icemaker/Fridge in the Bar Cabinet• The wide flybridge is accessible through the external staircase in the aft cockpit with teak steps• Windscreen in plexiglass and steel• Pilot console includes:-Steering Wheel-Main Engines Controls-Main Engines and Reversing Gear Gauges-Instruments for Navigation- Raymarine G series plotter/radar-Raymarine autopilot, ST 70 depth/speed, VHF radio-Icom VHF radio back up-Bow Thruster Control- Hydraulic-Stern Thruster Control- hydraulic-Forward Anchor Winch Control-Navigation Lights Control-Horn Control-Search Light Control-Fire Extinguisher Pump Control-Trim Tabs Control-Maneuvering Intercom• Helm Settee in Fiberglass with Cushions on Starboard side, with 3 seats, backrest and storage underneath.• Bar unit on portside with sink, and storage, bar top and working top. Bar Top in Teak and Working Top in Granite.• L-Shaped Sofa Area beside the Console Station with Little Table in Teak.• Storage unit in fiberglass on starboard side, between the bow sofa and the dining area.• C Shaped Sofa on Starboard with Storage Underneath.• One Table in Teak for 10 people starboard side, with Central Removable Extension.• Three Teak Folding Chairs.• Tub Installed Inside a Fiberglass Cabinet with Access Step in Teak.• Sunbathing Area beside the Tub.• Fiberglass roll bar includes:-Navigation Lights-Antennas-Horn-Search Light-Two Stainless Steel "95" Logos• Searchlight (Jabsco 60080-146SL) placed on Bow of the Windshield.• Draining Holes.• Antiskid Flooring.• U-Shaped Stainless Steel Handrails on Sides of the Flybridge and around the Area of the Staircase to Main Deck.• Watertight Spotlights on the Roll Bar.• Covers for the Sofas, Sunpads, Tables and Console.